Carlos Huante talks Alien: Covenant concept work. Carlos Huante is one of the many talented concept artists who worked on Prometheus. He recently updated his Instagram page with numerous Prometheus concepts (including several new pieces). One of the things that fans have noticed is that the creatures from Alien: Covenant seem to share similarities with unused designs from Prometheus. 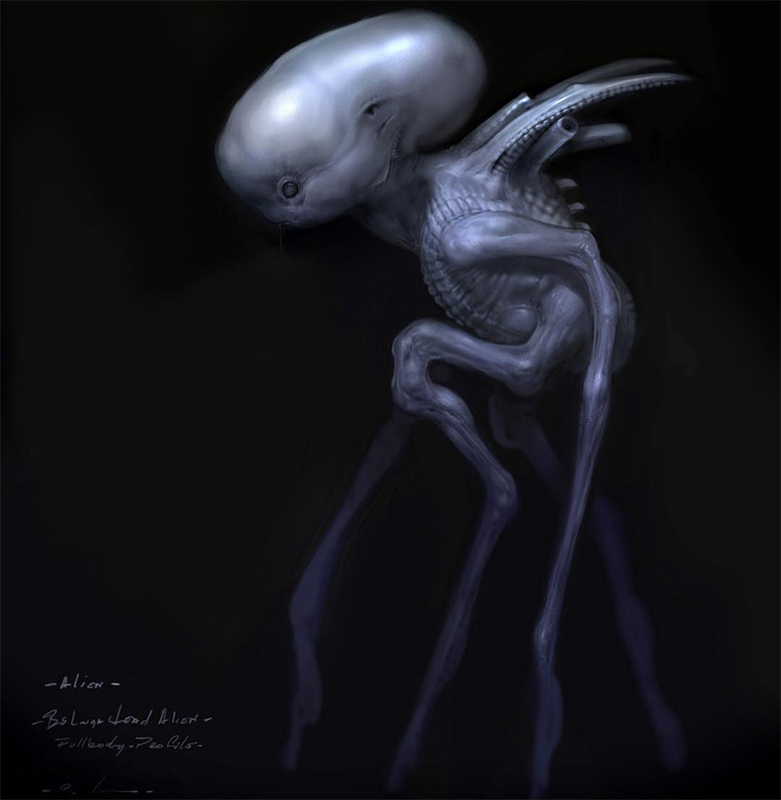 The Neomorphs appear to have been influenced by some of the Proto-Alien and Deacon concepts and we’ve seen Huante’s Beluga-Head concept (for the Fifield Mutant) in some of the leaked pictures. Carlos Huante talks Alien: Covenant concept work. This is the Beluga-Head, one of Huante’s Prometheus concepts that seems to have influenced some of the creature design in Alien: Covenant. Carlos Huante isn’t the only artist from Prometheus who provided some concept art for Alien: Covenant. When we spoke to Wayne Haag, concept artist and visual effects concept artist from Alien: Covenant, he revealed that Steven Messing had also been working on Covenant, doing spaceship designs. Back in 2012, community member ThisBethesdaSea (also known as JM Prater of the Perfect Organism Podcast) spoke to Carlos Huante on behalf of Alien vs. Predator Galaxy. Head on over and check out the full interview! In the comments section for the Buluga-Head alien he says the reason it was not used was because no one in Scott Free Production could realize it and he would have done it himself if they hadn't run out of money. Even though Ridley loved the creature which was made before his work on Prometheus. I wonder if the reason the alien got cut out of Prometheus was because the one Scott wanted to do was too hard to do practically. I can't imagine movie being thrown away two film two (very) different versions of a movie—even the Prometheus cut that was rumored to have been filmed as PG-13 from back in the day, I believe, was nothing more than hearsay. It wasn't hearsay. There were two different cuts of Prometheus made, an R and a PG. I guess he meant, that he did designs for one script before it was Covenant and after it became. We do know already, that there where several script attempts before they started filming. I guess somewhere was mentioned, that a dozen scripts went over the desk before they found the right tone. Back in October 2014, the "Prometheus 2" script was already at 15 drafts with three different writers involved. Refresh my memory, is there confirmation online about this? Personally I reckon they were just struggling to find a direction that carried on with Shaw. I think movement started when they settled on this Shaw-less direction and went for it as a bit of a soft restart. Possibly the 14 draft scripts focused more on Elizabeth Shaw, and may form the basis of the events in the prequel novel that Alan Dean Foster is writing. When Michael Green was brought on board, that's when the first reports of the film being more Alien like. So he likely made concept art for Jack Paglen's Prometheus 2 before Green started the Covenant conversion (which may explain why John Logan has sole screenplay credit). Yeah, he's referring to different drafts of the Prometheus 2/Alien: Covenant. We knew they were struggling for a while to find a direction to go with this. So any chance of seeing both versions on home release, if they filmed both ones?? I'm sure he may be referring to drafts? I can't imagine movie being thrown away two film two (very) different versions of a movie—even the Prometheus cut that was rumored to have been filmed as PG-13 from back in the day, I believe, was nothing more than hearsay.